Charles Culpepper, Son, M, S, W, 10, N/A, FL/SC/GA. Eunice Culpepper and W. F. Rudisil on 24 Oct 1882 in Orange Co., FL, Book 1-2, p. 130. Biography* � In 1880, John was listed with son Nick Drake in Lauderdale Co., Mississippi. John C. Drake was also listed in muster roll of Donaldson's Mounted Co., Alabama Militia, June 25, 1836 to Sept. 3, 1836 - Creek War. 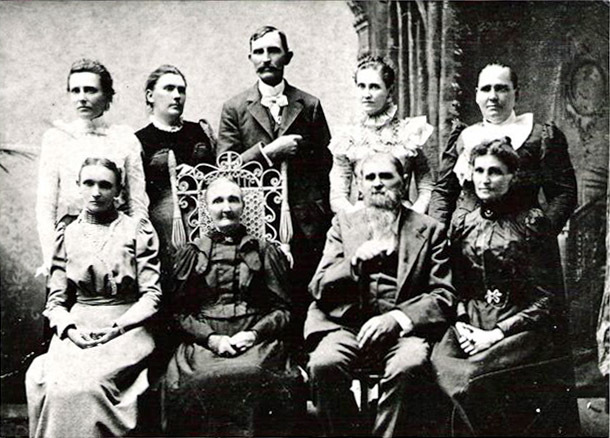 John C. and Catherine Smith Drake had 10 children. John C. Drake's parents were Ephraim Drake b. 1789 d. between 1850-60. I think John's mother's name was Abigail - but that is all I have on her. In 1840 Ephraim is in Cherokee Co., AL (next to John C. Drake). Ephraim was on the 1814 and 1819 tax list for Washington Co., TN and the 1830 census has him in Washington Co., TN. Ephraim's father was also named Ephraim and he was b. abt 1760 in Virginia and d. 1816 in TN. He married Ann Buchanan. I'm not sure of my info. back beyond Ephraim and Ann. Source: Jill G. Lewis, Jun 2001. From QRZ.com: Amateur Radio License KC5FYH, Earl R. Culpepper Sr., Graham, TX. E-mail written 2001 to Lew Griffin from Harold Fowler. Mary L. Culpepper, Daughter, F, W, 6, sng, AL/AL/AL. John W. Culpepper, Son, M, W, 3, sng, AL/AL/AL. James M. Culpepper died Jan 1934 in Bullock Co., Alabama. Annie L. Culpepper died 15 Jun 1942 in Bullock Co., Alabama. JACKSONVILLE, Fla. Funeral service for Gladys Culpepper Fowler, 84, will be Sunday, Oct. 10 (2004), at 2 p.m. at Gray Funeral Home chapel with the Rev. David Stewart officiating. Burial will be in Sandfield Cemetery. Mrs. Fowler died Oct. 7. She was formerly of Union Springs. She was born Aug. 7, 1920 in Corinth to Jim and Annie Culpepper. For 41 years she was employed at Cowikee Textile Mille in Union Springs. She was a member of Eastside Baptist Church. She was preceded in death by her husband, Gilbert Fowler; son, Virgil Fowler; brothers, Johnnie Culpepper and James Culpepper; and sisters, Jessie Lee Dease, Lois Dease, Clyde Stewart, Annie Mae Austin and Ada Austin. She is survived by daughter, Margaret McKinney of Jacksonville, Fla; son, Harold Fowler of Talladega; grandchildren, Sheila Jones, Ervin (Gloria) McKinney, Paul (Renee) Fowler and Eric Fowler; great-grandchildren, Chris Camp, Tammy Jones and Will Fowler; great-great-grandchild, Brandy Camp. The family will receive friends at the funeral home from 1 p.m. until service time Sunday. Hugh R. Walker, 25, M, Wh, MS, married July 1870. James Culpepper, GSon, M, Sng, Wh, 21, N/A, MS/SC/SC.